“Is it safe to come out yet? 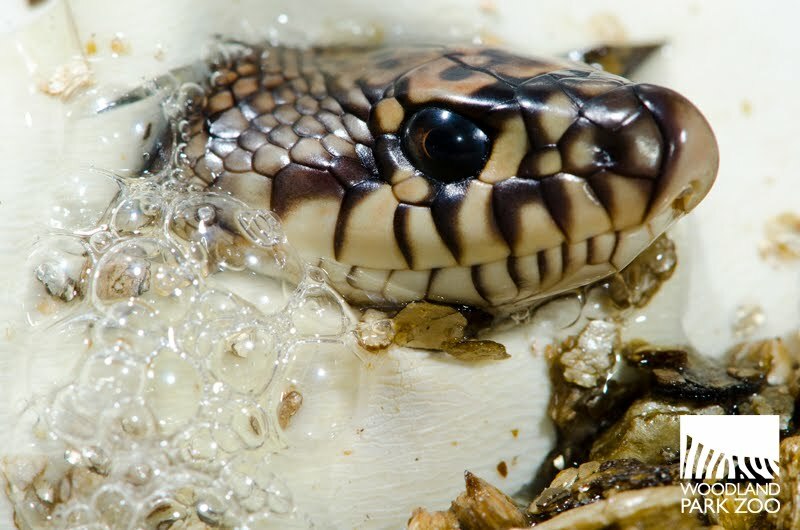 Not yet, maybe tomorrow.” These are the thoughts that might arise in the brain of a Louisiana pine snake hatchling. It is a chance decision that could mean your life or death in the wild. The Louisiana pine snake, Pituophis ruthveni, is a species under threat from habitat alteration of its native longleaf pine forest in the southeastern United States. This species has just increased its numbers on planet Earth by two, thanks to hatchlings that emerged late this summer at Woodland Park Zoo’s Day Exhibit. This accomplishment might not sound like much, but when your species is rare in the wild and is represented by fewer than a hundred snakes in about 18 Association of Zoos & Aquariums-accredited zoos nationwide, every bit helps. 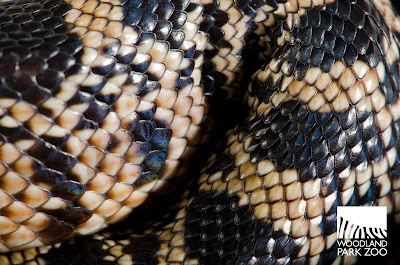 Woodland Park Zoo’s role in the Species Survival Plan for this snake was simple: pair up our male and female, individuals recommended for breeding by the population manager for Louisiana pine snakes, and hope for egg-laying in early spring. 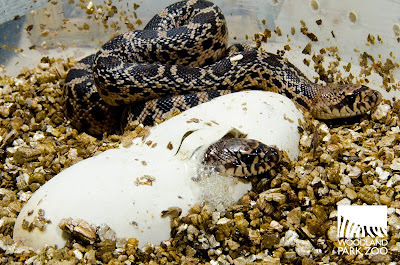 In early June, our female came through and laid a clutch of eggs! Interestingly, the eggs of this species are relatively quite large (approximately 4 inches long). To care for the eggs, zookeepers at the Day Exhibit made their own nursery: a plastic shoe box with a mixture of vermiculite (think fancy potting soil) and water. The eggs were carefully nestled into the bedding, and placed in the incubator at a comfy 80 degrees Fahrenheit (28 degrees Celsius). The eggs were allowed to incubate for 65 days during which the embryos developed slowly into approximately 18-inch-long snakelets. Two and a half months later, during their routine checks, zookeepers lifted the lid of the shoe box. The first snake to pip or emerge from its egg was periscoping from its shell, getting its first look at its new world, but then quickly retreated back into the egg. The following day, two fully emerged juveniles were pressed tightly around the edges of the incubation box. After their first shed, which normally takes about a week, zookeepers offered these snakes their first sustenance: baby mice. 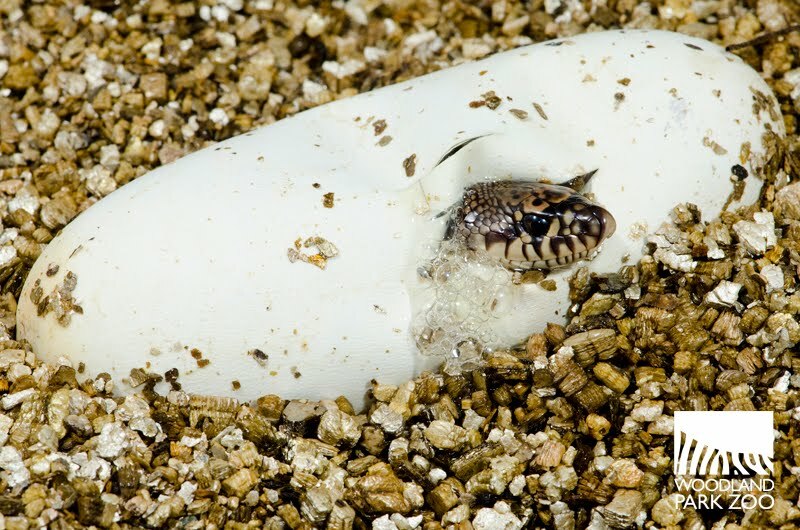 Within two weeks after hatching, our two baby snakes were sent to Memphis Zoo, where they will be part of their reintroduction program for this species. As a part of that program, our babies will soon be on their own, released into the wilds of Louisiana, fending for themselves as they help rebuild the wild population of this endangered species. We wish them luck in facing the significant challenges ahead!